Five years ago on May 16th, we buried my father, Joseph Caprino, in upstate New York, where I grew up and where he lived with my mother for 50 years. Dad died at age 92, just shy of his 93rd birthday, of prostate cancer that had spread throughout his body, He also suffered from dementia and a host of other serious ailments. The end of his life was so very difficult for him, and for my mother in her selfless care of him, during which time he also suffered from scoliosis, spinal stenosis and diabetes, and couldn’t stand erect or walk without assistance. My mother and I sat with Dad for several hours after he passed over, waiting for the funeral home to come and collect his body. During that time, I had the powerful chance to reflect in a new way on my father’s life and its impact on me. I experienced a myriad of thoughts and feelings that my normal, crazy-busy life and work didn’t allow me to focus on. I thought about life, death, meaning and purpose, regrets, joy, what makes life worth living and what I want to leave behind. My father had a true knack for making the people around him feel truly loved and appreciated. I had the stunning realization in sitting with him after his life energy had left him that no matter how “prepared” you think you are for the loss of a beloved, you’re simply not and can’t be. You have to learn and experience through time just how to adjust to being who you are in the physical absence of this individual who helped shaped you into being. The Yiddish proverb “Man plans and God laughs” rings very true to me these days. My friend Jean shared, “Adjusting to the loss of a loved one is a very difficult thing until the memories are fully rooted in the place where our loved ones once were.” Such true words. I think of my father every single day, and when I want to feel him near, I pick up and hold in my hand a beautiful silver cross that he wore around his neck during his time fighting in WWII. 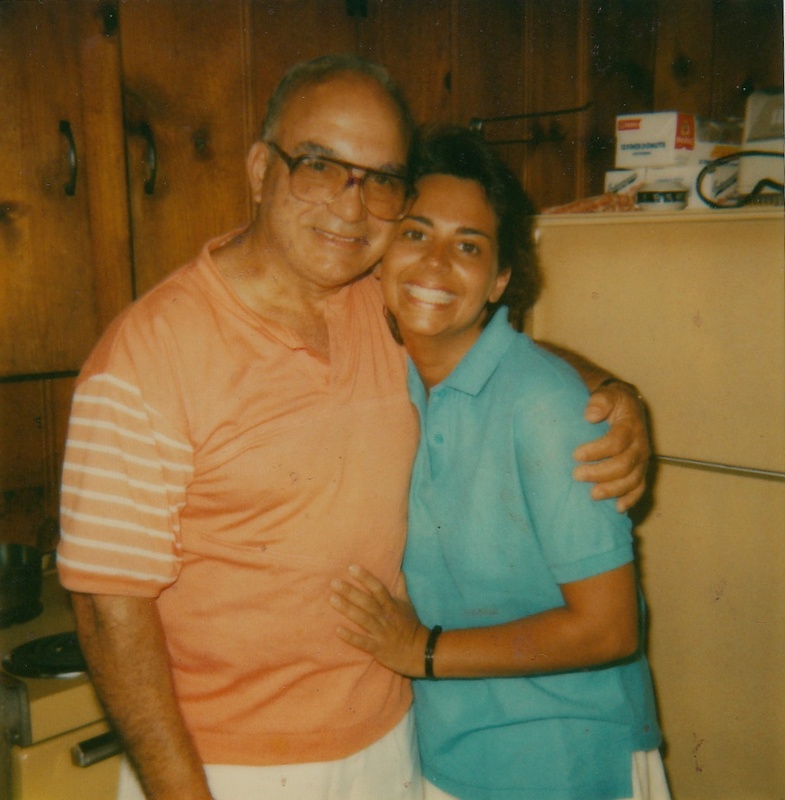 The experience of losing Dad helped me realize even more clearly how important it is to live your life in a way that you will not regret, or bemoan, or wish you had done things differently. Through each choice he made — in his words, deeds, and beliefs — Dad lived each day to the fullest with such gusto and exuberance, embracing each moment as a way to squeeze the most joy and fun out of life. How to do that? I try to always do my very best, and in the process, forgive myself when I fall down, which I do frequently. I work hard to act from my “higher self” — the version of myself that I recognize as having a different voice and energy, one that is not directed by my frail ego, or my insecurities and defensiveness, but is from a place of self-love and self-work, compassion and connectedness. And when I’m not acting and communicating from my highest self, I feel it and it shows, and I try to make amends for when I hurt people and treat them in ways that later feel wrong. That was his way of telling us to please stop tearing others down — he just wouldn’t allow it. Since I read The Four Agreements (which was a true life-changer for me), I have tried to be impeccable with my word, to not “sin” against myself and others with my words. I don’t always succeed, but I’m sincere in my effort to make progress on this. Dad paved the way for me to understand that our words can be used as a salve for the soul, or as weapons of destruction. I try every day to choose the former. Helen and I met in the JFK airport when we were just 20 years old, on the way to our year study abroad program in London. We’ve been friends ever since (almost 40 years), but I never knew she experienced Dad that way or remembered those moments so long ago, and am so grateful to know it now. There was a gentle sweetness and openness about Dad always, even when he said embarrassing, blunt things to my friends and I wanted to hide (like, “Hi Sally, you married yet?”). Or when he botched and mispronounced so many of my friend’s last names. He sure could put his foot in it, but even when he did, people sensed he wasn’t trying to be hurtful. They forgave him knowing he just lacked a bit of a filter. He never meant ill or harm, and being with him felt to most people like being embraced in a huge, warm bear hug of love and acceptance. In our world today, and in my work in the media in particular, I see how we’ve let so much cruelty, snarkiness, judgment, hatred, divisiveness and negativity creep into every moment of our lives. In the news, the media, in our pop culture, we’re bombarded by fear, pain and suffering. Call me crazy, but I’d rather focus on gentleness, kindness, love and compassion – in the world around me and in what I choose to let into my personal sphere. I opt to focus my work and shine light on people who are changing our world for the better, making their impact in a positive, compassionate way. I know this to be true (and it was reinforced in my training as a marriage and family therapist): What you focus on truly expands and grows, and you can indeed shape your experience of happiness, joy and fulfillment with committed, conscious action, despite your environment and genetics. In honor of Dad and of all the fathers in the world today who have left a beautiful legacy for their children, I commit again to expanding my experience of goodness, love, joy and exuberant fun, just as he did. This Father’s Day, I hope you’ll bring to mind someone who has shaped your life in a positive, beautiful way. If it’s your father, that’s wonderful. If it’s not your dad but another person (male or female) who has made a deep and lasting beneficial impact on you, I hope you’ll reach out to them. Write an email, a letter or a post about it, share a Facebook note, and just shine a loving light on their life lessons. And let’s do one thing today that will honor them and the role they played in shaping your life for the better. Let’s remember too all those who brought more happiness and positivity into our world, and who have made us feel joyful and loved in a way no one else has.